The Senate Finance Committee's ObamaCare bill will spend $829 billion over ten years, but fill-in CBS Evening News Maggie Rodriquez trumpeted how "according to a new report from the nonpartisan Congressional Budget Office, the plan costs less than expected and would actually reduce the deficit. So why do Republicans still oppose it?" Instead of explaining the skepticism toward how the massive additional spending could lead to less spending, reporter Nancy Cordes touted how "the new numbers give health care reform a much-needed boost" and credulously recounted the spending would be offset by fees, taxes "and trims to Medicare." When Republicans proposed a reduction in the rate of increase of Medicare spending the media screamed about "cuts." Now a $400 billion change is merely a "trim." And who really believes that proposal will ever pass? "The result," Cordes maintained, "a net savings to government of $81 billion over 10 years" before she championed: "It's estimated the new bill would allow 29 million Americans who don't currently have coverage, Americans like Javier Salinas, to buy it." Nonetheless, "Republicans still oppose the bill, despite the lower price tag." CBS was hardly alone in gullibility. Front page Thursday Washington Post headline: "Health-Care Bill Wouldn't Raise Deficit, Report Says." Earlier, about The Early Show: "CBS Touts Baucus Health Care Bill 'Pays For Itself,' 'Saves Billions.'" MAGGIE RODRIGUEZ: Now to the battle over health care. The Senate Finance Committee said today it will vote on its reform plan next week, and according to a new report from the nonpartisan Congressional Budget Office, the plan costs less than expected and would actually reduce the deficit. So why do Republicans still oppose it? Here's Nancy Cordes. NANCY CORDES: The new numbers give health care reform a much-needed boost. SENATOR MAX BAUCUS (D-MT): I'm very pleased. CORDES: Pleased because congressional number crunchers now say the $829 billion price tag for the Senate Finance Committee's bill would be more than offset by fees on drug makers, taxes on top-dollar insurance plans, and trims to Medicare. 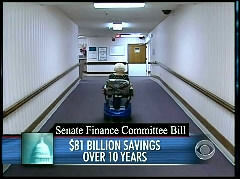 The result, a net savings to government of $81 billion over 10 years. It's estimated the new bill would allow 29 million Americans who don't currently have coverage, Americans like Javier Salinas, to buy it. His family of four could get a subsidy of $5,500 a year for health insurance because they earn less than $88,000 annually. JAVIER SALINAS, KITCHEN MANAGER: I can't sleep thinking what if one of my kids is going to get sick or, you know, something else, but with that help from the government, it's a peace of mind. CORDES: Wealthier Americans would be required to buy insurance or pay a penalty, up to $750 a year. While businesses with more than 50 workers would have to pay up to $400 for every low-income worker they don't cover. That means the owner of the D.C. restaurant where Javier works would be exempt because he only has 32 employees. So your responsibilities wouldn't change at all. FRANKIE DOYLE, OWNER OF PORT OF PIRAEUS RESTAURANT: Thank God. Thank God they wouldn't change at all because this year was our worst year ever in business. CORDES: Republicans still oppose the bill, despite the lower price tag. ERIC CANTOR, HOUSE MINORITY WHIP: The fact is the numbers are arrived at by taxing businesses, by taxing people who have insurance as well as cutting benefits for seniors. That's not an acceptable health care reform recipe. CORDES: Plus, the recipe is still being written. This bill is one of five. It has to be reconciled with the others. So all those figures are bound to change.